Architects, get ready to swoon — an Italian designer has created a desk that’ll make working through the night feel downright fashionable. 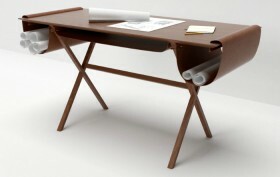 Designed by Giorgio Bonaguro, the Oscar desk was first shown off during Milan Design Week 2014. It features a solid ash wood tabletop and soft leather pockets that hold drawings and notes, creating a sophisticated, yet functional look.